Last Friday I made a trek down to the San Francisco peninsula, to visit and chat with a couple of other VR folks: Cyberith, SVVR, and AltspaceVR. In the process, I also had the chance to try a couple of VR devices I hadn’t seen before. Virtual locomotion, and its nasty side effect, simulator sickness, are a pretty persistent problem and timely topic with the arrival of consumer VR just around the corner. Many enthusiasts want to use VR to explore large virtual worlds, as in taking a stroll through the frozen tundra of Skyrim or the irradiated wasteland of Fallout, but as it turns out, that’s one of the hardest things to do right in VR. 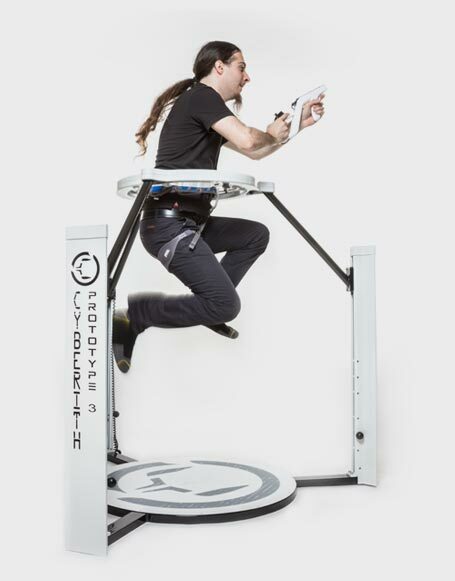 Figure 1: Cyberith Virtualizer, driven by an experienced user (Tuncay Cakmak). Yes, you can jump and run, with some practice. Just a few weeks ago I gave a presentation on the topic at the third SacVR meet-up. While the talk was primarily about the software engineering and architecture challenges that are the result of nobody (yet) knowing how to do virtual locomotion right, I also set aside a chunk of time to talk about simulator sickness, or at least as much or little as I know of it. During that talk I also briefly touched on different approaches to omni-directional treadmills, i.e., the two main classes being developed right now (“slidemills” such as Virtuix Omni and Cyberith Virtualizer, and true motorized treadmills such as Infinadeck), and how those could potentially alleviate simulator sickness. By no coincidence at all, another speaker at the same meet-up was Tuncay Cakmak of Cyberith. Unfortunately, Tuncay and his co-founder Holger Hager were delayed by Bay Area Friday afternoon traffic and missed my talk. Which was a bummer, because Tuncay’s talk and mine would have meshed perfectly. Anyway, we got to hang out after the meet-up, two weeks ago I decided to invite myself to their offices in Redwood City, and last Friday I got to try the Virtualizer for myself. First off, check your expectations. Using an omnidirectional slidemill (disclaimer: haven’t tried Virtuix Omni) is entirely unlike natural walking. In fact, it has to be learned, and takes practice to become proficient. I used the Virtualizer for around ten minutes, and started off feeling like a toddler again. At the end of the time, I was able to walk with purpose and generally arrive where I wanted to go, but I could not yet trot or run, or side-step. Observing Holger himself using the system, on the other hand, showed that walking or running on a slidemill can become second nature, and even look elegant, after however long Holger has been doing it. Another important observation: it’s quite the workout, a bit like wading through knee-deep water. At the end of my 10-minute practice session, I started breaking a sweat (and I’m no couch potato). If these things take off, we’ll be seeing lots of very fit gamers. Here is how it works (walking, that is): to use the Virtualizer, the user steps into a harness (similar to a climbing harness, and a slightly pinchy one for the male anatomy, if you catch my drift — but they’re working on that). This harness is attached at waist level to a metal ring with an inner part that rotates freely, and the user starts walking by leaning forward (or backwards, sideways, etc.) into the ring until the feet start sliding in the opposite direction. The rest is just picking up feet in the back and placing them forward again, in an approximation of a walking motion. It’s important to point out that one does not slide one’s feet forward and backwards in a fakey swishy-swashy motion, but actually has to lift one foot at a time. The user can control speed by moving the feet faster, and leaning a bit heavier into the harness at the same time, and I saw that the Virtualizer measures walking speed and direction with surprising accuracy when Holger showed me a calibration program. To change direction, the user simply turns in the harness, which, again, rotates freely, and walks forward in the new direction. That part is very natural. The first hurdle to overcome is fear of falling when leaning forward (you won’t fall! ), but I got over that quickly. The second hurdle, at least for me, was that I naturally walk in overly long strides. The Virtualizer is best at sensing short strides, so my avatar started out moving in an annoying stuttering fashion until I realized what the problem was and corrected for it. Once I conditioned myself to that, the Virtualizer recreated my real motion in the virtual world convincingly. It is also possible to crouch and to jump (the harness and ring are spring-loaded and adjust in height), but when I tried a little jump the Virtualizer made sounds as if it was very unhappy with what I was doing, and I made no further attempts (but I was reassured that everything was perfectly fine). So, if using a Virtualizer is not like natural walking, what’s the point? Well, as it turns out, I was walking through a large-scale virtual environment for about 10 minutes, and I didn’t feel any discomfort at all. For comparison, just the previous day I had run through a neuroscience experiment using an Oculus Rift DK2 with keyboard locomotion controls (but that’s a topic for another post), and felt dizzy and slightly unwell after only a few minutes. I’m not a good test subject for simulator sickness, and this is only anecdotal, but the Virtualizer seems to have a positive effect. I can see several causes: most importantly, there is no virtual turning. The only way to turn the avatar is to turn physically, and the real and virtual rotations are linked 1:1 and quite accurately. And there are two additional effects I also discussed in my SacVR talk: there is some proprioceptive feedback from moving one’s feet, even if those motions are not exactly natural, and there is some acceleration noise imposed on the vestibular system by bobbing in the harness, which might drown out the missing acceleration cues from being locked in place in the real world while moving in the virtual one. There are a lot of interesting perceptual and neurological questions here, but for now this looks very promising. To drop a teaser: I just started working with a neuroscientist who studies spatial perception, specifically how the brain forms allocentric, i.e., “third person” spatial maps of locations from exploring them egocentrically (“first person”). This researcher has so far used “2D VR,” i.e., first-person games on desktop or laptop computers, but just started getting into proper VR using Oculus Rift, and now wants to experiment with treadmills to investigate how these different levels of VR affect map formation. After having tried it, I am very curious to learn where slidemills like the Virtualizer fall on the spectrum between keyboard locomotion and real walking in the real world. Bottom line: what’s the verdict? We’re still not close to a convincing simulation of real walking in VR (my money for that is on motorized 2D treadmills right now), but if slidemills like Virtualizer really do alleviate simulator sickness in a significant way, then they’re a huge step ahead in VR usability for the kinds of applications that many people desperately want to do. Will there be a big home market? Virtualizer is a bit on the pricey side for a home user at USD 1,250 / EUR 1,500, and requires a good bit of floor space, but it’s a different story for professional use, be it VR arcades, (military) training, or research. I definitely want to have one for my lab right now, and not just because we have a neuroscience research project all lined up. As an aside: Cyberith’s first demo used an orientation-tracked Wiimote to control a gun, and trying to aim at pop-up targets using that I realized how unconvincing, immersion-breaking, and plain crappy non-position tracked input devices are for VR, once you’ve gotten used to the real deal. Just saying. Hey, I saw a real-world Sixense STEM System at SVVR‘s new hub/headquarters in Redwood City, and it was even plugged in and turned on, and tracking motion! Maybe I’ll even get to thoroughly evaluate it at some point. 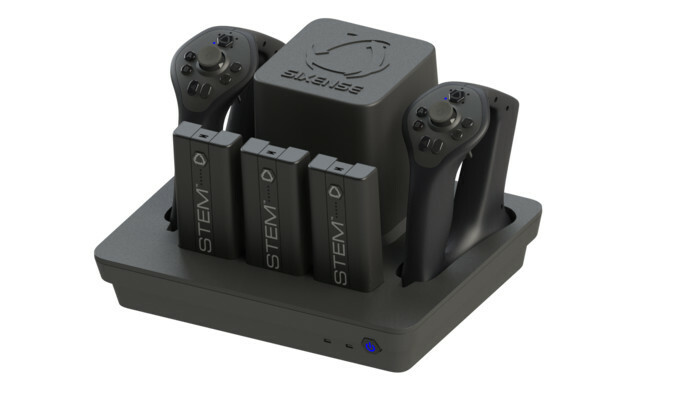 Figure 2: A Sixense STEM System with two hand-held controllers and three additional trackers. As I had never tried an HTC Vive before, it was quite serendipitous that AltspaceVR had one installed in their lavish offices in Redwood City. I wasn’t there for that, but had a chance to take it for a spin anyway. There isn’t much to say about it that hasn’t been said a thousand times before. It works more or less exactly like it’s supposed to. The display and tracking quality (provided by two Lighthouse base stations) are great, and the hand-held controllers feel nice. 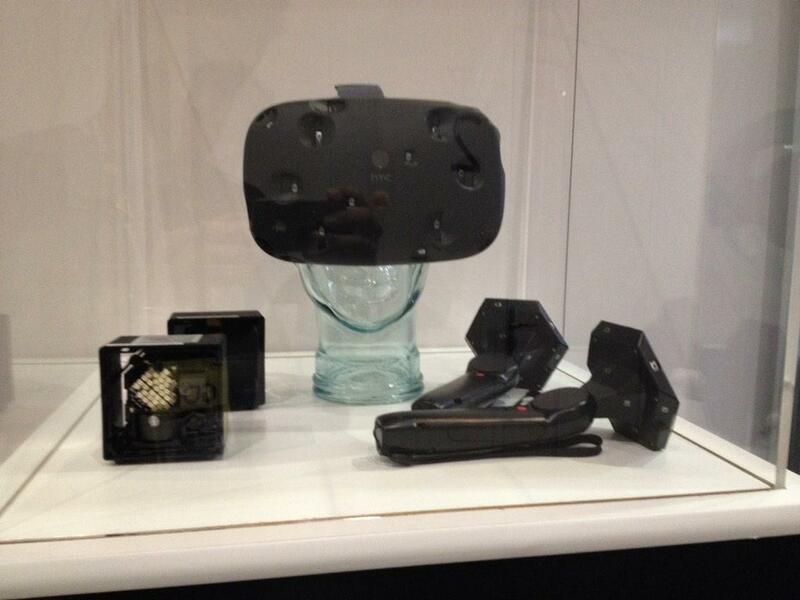 Figure 3: HTC Vive headset, hand-held controllers, and two Lighthouse base stations. From a quality standpoint, it’s at the level where it could be used for serious work, as a replacement for high-end VR displays such as CAVEs. The only thing where the Vive might still be lacking is comfort of long-term use. The current headset prototype is still somewhat heavy, with most of the weight hanging off the front of the head. My current feeling is that it would be more painful to wear for several hours at a time than a pair of relatively light-weight 3D glasses. But given that the announced consumer version of the Oculus Rift has significantly reduced weight and better weight distribution, and that HTC will definitely try to match or exceed that, it might only be a short while before commodity HMDs become viable replacements (they are, of course, already unbeatable in the price department). Better to be ready for that. This entry was posted in VR Hardware, VR Methods and tagged 3d displays, 3D interaction, 3D tracking, Cyberith Virtualizer, HMD, HTC Vive, Locomotion, Motion Sickness, Oculus Rift, Omni-directional treadmill, Sixense STEM by okreylos. Bookmark the permalink. You are certainly not a couch potato – you are a lab potato. For games that don’t got a different command associated with double/multiple tapping of the movement keys, it should be possible to get some approximation of analog input with keyboard emulation by using some form of pulse modulation (things get a bit more complicated when dealing with walking, running, and crouching speeds being different in game; but the modifications to the modulation frequency can probably be figured out by trial and error, or if you got the exact numbers of the game speeds, with some math). I’m not sure what effect this might have on VR sickness though; and that might also depend on how the game handles player motion (acceleration and inertia effects mainly, I guess). I loved your write up on VR locomotion! Have you seen the GameRunner? (gamerunner.com) It’s a user-propelled treadmill with a steering column that plugs directly into your game engine and it’s got literally every VR game function you could want or need. Since you’re steering with your hands on the controller as you walk or run, (at your chosen pace) and all of your game functions are finger accessible on the steering column, you can “safely” wear a VR headset while you walk around (and steer like on a bike) and interact fully in the VR world. Let me know if you want try it out. We are right in Roseville. How would hand tracking work with this? What about the issue of VR sickness due to turning in game without turning in real life?